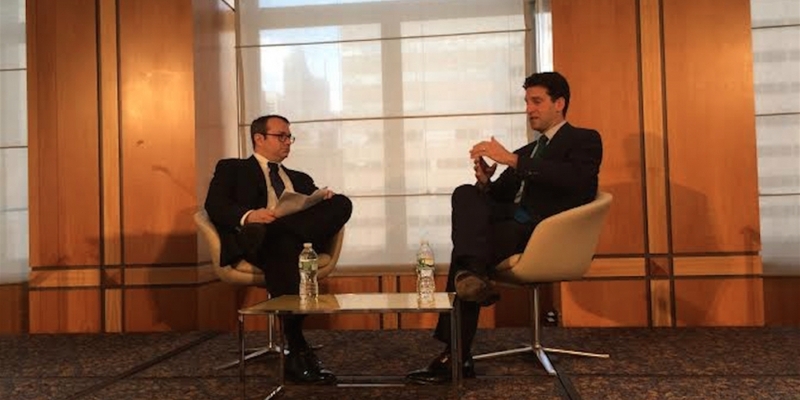 Former New York State Department of Financial Services (NYDFS) superintendent Benjamin M Lawsky issued his first public statements on the BitLicense today following his stepping down from the position in June. The comments came during an interview with American Banker editor in chief Marc Hochstein at the second annual American Banker Digital Currencies + the Blockchain Conference in New York City, which also featured Digital Asset Holdings CEO Blythe Masters and Digital Currency Group CEO Barry Silbert, among others. Overall, the conversation stuck more broadly to areas of interest for Lawsky’s new consulting initiative, The Lawsky Group, which include cybersecurity, data management and traditional financial regulation. Lawsky indicated that, while it would be possible for him to consult on matters related to the industry, he would be unable to advise on his past experience with the NYDFS. Perhaps the most interesting question was posed by a crowd member who sought Lawsky’s opinion on how digital currency regulation could be expected to evolve domestically and internationally. Though again short in his comments, Lawsky offered some interesting color on his past work with the NYDFS. “It feels to me like there’s been less focus overseas. I was in Basel, [Switzerland] when Mt Gox collapsed and I was in the room with insurance and banking regulators from the 15 biggest countries in the world,” he recalled. None, he said, demonstrated an interest or understanding of the nascent technology. Lastly, Lawsky reiterated his belief that decentralized ledgers could evolve to become a valuable ally for law enforcement.